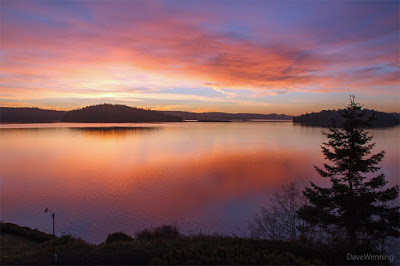 At Skywatch Friday, I know the photos with a lot of red, orange and yellow in them get the most attention. But the sky that I watch sometimes looks like this. 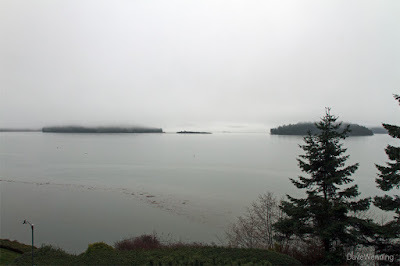 Yesterday, it stopped raining long enough for a quick hike across Kiket Island in the Kukutali Preserve. I haven't seen our neighborhood eagles for a while and wondered if they might be hanging out over there. By the time I got there, about fifteen minutes later, fog had rolled in. For the moment, eagle viewing was out of the question. I decided to go exploring anyway and see what else might be going on. 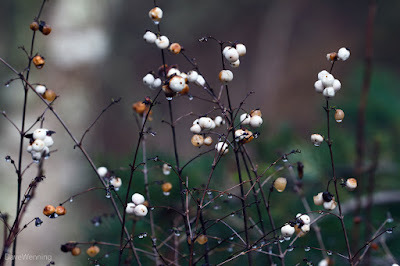 Left over from last season, I found Common Snowberries(Symphoricarpos albus) right next to the little parking lot. At the west end of the island, Oregon Grape(Mahonia aquifolium, Berberis aquifolium) is starting to bloom. Around here, that means spring is arriving. The leaves turn bronzy red in the winter. With warmer temperatures, they will again become dark green. What is it about a trail that is so enticing? I find myself compelled to follow its course to see where it goes. What's at the end? What will I discover along the way? 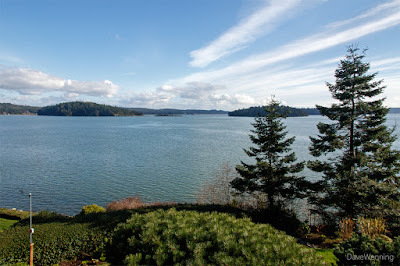 I was delighted when Deception Pass State Park announced that this year's First Day Hike would be at Hoypus Point at the north end of Whidbey Island. 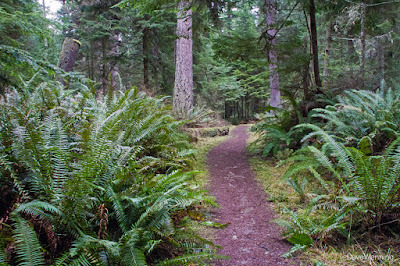 I had hiked all of the Deception Pass trails now except the ones in this section of the park. For me, Hoypus was terra incognita. It was about time for me to get to know this part.